In most countries, it is accepted that children with learning or intellectual disabilities will benefit from early intervention and that is the theme of our first two articles. Early intervention programs began in the 1970s when research indicated that both children and adults with learning disabilities need structured teaching and practice in order to help them to learn skills and activities that typically developing children acquire in their early years without explicit teaching - mainly all the skills that typical five year olds have when they start school such as walking, feeding, dressing, talking, socialising and managing their behavior. The research indicated that we needed to break these skills into small steps and to find ways to teach them, building in much successful practice to help children achieve them. All children need practice to consolidate and improve their learning and they seem to do this naturally, as parents of toddlers know when they see them practice new skills such as standing or walking. Research with children with Down syndrome indicates that they need more repetition and practice to consolidate their learning and reach their 'personal best' in any skill. They may need much patient encouragement to practice enough through individual sessions and family or group games. The early research also supported the view that we need to scaffold children's learning by showing them how to succeed - modelling an activity with the child by holding their hand to help them complete the task or to learn by imitating as we take turns at the task with them. In this way, they practice the correct sequence of actions to succeed at the task. Many children and families benefit greatly from services such as Portage home teaching programs, which provide a home teacher for the family in their own home in the first 3 years of life. This service is usually highly valued by parents and they learn how to extend their natural play and interaction with their child in order to help the child to overcome some of the effects of his or her disability and learn more effectively. However, one-to-one teaching can become quite demanding for children, as they are always under the spotlight and expected to 'perform' the task. Groups can make the learning more fun as the children take turns, and children who already know the task can model the correct responses for others who are still learning. In the groups, children are also beginning preparation for preschool and school, where they need to be able to learn without one-to-one support and to take turns - sitting quietly while others have their turn. Families can also turn teaching activities into games by involving other adults or children in the family - this often persuades a reluctant learner that he or she would like to join in! However, formal groups can also be quite demanding as they do require the child to sit, attend and to wait. Many toddlers with Down syndrome are surprisingly good at this but some do find it difficult and need to be gently encouraged to stay in the group - this is one reason why the pace of activities needs to be quite fast - small tasks which can move from child to child quite quickly. 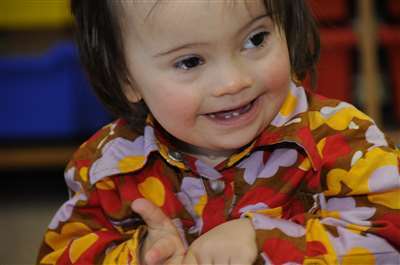 While we think that it is important for parents to understand what their child with Down syndrome needs to learn, the specific difficulties that are holding them back and to build in more teaching and practice to help them to progress, we need to stress that the children are learning during all their waking hours and it is all family interactions while feeding, bathing, shopping, walking in the park etc. that provide all the quality learning experiences. The group activities described in the next article are designed to help parents to be more effective in their natural communication with their child and to practice activities for perhaps 15 minutes a day. However, it is the all day/every day interactions within the family that really help children to learn - attending 'therapy' sessions will help to give ideas and keep up parents' motivation but parents and therapists need to recognise that children do not learn to talk from these sessions alone. Therapy sessions are successful when we transfer our skills, knowledge and confidence to parents, and they then become more effective natural communicators and teachers at home.